Picturesque Chitral town sits up in Pakistan's northwest district, walled in by the Hindu Kush range. During winters, the only way in is by air (weather permitting) as the two passes, the 3118-meter Lowari from Dir and the 3810-meter Shandur from the upper Gilgit Valley are closed to road traffic. The Fokker Friendships drone for 50 minutes and burst through clouds on decent to reveal on mountains covered with whitecaps and red tin roof houses. This is Chitral. On the small airfield, the cold wind thrust you to shiver. The remoteness of the district has left it undeveloped in spite of grand natural beauty, hospitable people and ancient history. The town is a base camp for tourists, adventurers and researchers from across the world. And, people seem to be living there in peace. Chitral, located at 1500 meters from sea level is a beautiful and historic town. It has lively bazaar -- a miniature Peshawar full of Mediterranean looking faces under Chitrali caps and foreigners. Geoffrey Moorhouse in his book "To the Frontier" describes the seen in Chitral town: men squatted in the shade of a tree beside a food stall or middle aged man seen stroking a dog." It is no truer. Now the modest bazaar is lined up with well-stocked provision shops, eating joints and souvenir shops selling many things from Chitrali caps to Lajvard (Armenian stone) and Zamurrad (Emerald) that find their way in the town, for the tourists mostly. However, American sleeping bags and rucksack, Bulgarian ankle boots and Korean Jackets that used to be on sale in bazaar during Soviet occupation in Afghanistan are no more sold there. Mehtars' fort on the banks of the Kunar River is a principal building that reminds of the bygone era. Go to visit the palace and the sleeping guard will ask for a permit from district management. The Mehtars' palace-fortress, site of the 1895 siege, is still occupied by royal offspring so you can not go in without special arrangement. The entrance of the south end is to the residential quarters. The one facing Shahi Bazaar used to be for the royal guards. The most interesting side faces the river and is best viewed from the far end of bazaar or form across the river. The river passing through the town is called Chitral (or Kunar) River, and upstream is known as Mastuj River. Another ornate building up the road toward the police station was the royal courthouse. The spacious Shahi Mosque next door was built by Mehtar Shuja ul Mulk. New minarets and domes have been added during recent renovation, keeping the edifice in its original shape. At the south end of town is one of Pakistan's best polo ground, where practice matches are held every few days from mid March to early November and full-blown matches on weekends. The town has weeklong tournament in September to October. With roaring crowds and drum and horn bands that play the signature tune of each player who scores a goal. Polo is still played in many up valley towns too, though it's a dying sport because horses are costly to own and no longer needed for transport. One of the biggest social events for Chitralis is days of super polo and merrymaking at Shandur Pass, which is held every few years since 1936. The Chitral valley has a long history. It was subdued by Alexander from Macedonian, Chinese army and Timur in the past and was under king named Shah Rais (descendent of Balti rulers) in sixteenth century. Son of Sangin Ali -- advisor of Shah Rais and forefather of Adamzada clan -- threw out the king and took over the power. 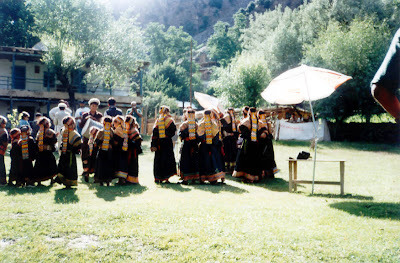 Kators (branch of Adamzada clan) ruled Chitral till 1960. In 1856, the British who were apprehensive about Russians in Central Asia had sent an expedition to poke around Chitral and win some friends. In return for a subsidy, Aman ul Mulk -- the first Kator ruler called Mehtar to attract outside attention who had taken over in 1857 -- became a British friend. After capturing Kuhswaqt (another branch of Adamzada tribe) land in the 1880, his domain stretched from upper Gilgit into Afghanistan. Aman ul Mulk died of a heart attack in 1892, one of the few Mehtars to die a natural death, since the usual way to decide succession for royal princes was to murder their father and one another until only one was left. This time 16 sons were caught unprepared. Result: bloody power tussle. Aman's second son Afzal ul Mulk seized the family fort and began eliminating his brothers. Nizam ul Mulk fled to Gilgit. Then Umra Khan, the ruler of Dir, invaded from the south. Aman's long exiled brother Sher Afzal (the only one he had failed to eliminate) appeared from Afghanistan with a small army killed his nephew Afzal ul Mulk and pronounced himself Mehtar. Finally, prodded by the British, Nizam returned. Sher Afzal ran away and everybody recognized Nizam as Mehtar. Two years later Nizam was overthrown by his half brother Amir ul Mulk. Umra Khan also edged up the valley, taking Drosh. In a show of force, the Gilgit Political Agent Major George Scott Robertson (writer of The Kafirs of the Hindukush) arrived at Chitral Town with 400 soldiers and moved into the fort -- the ancestral home. At this time, Sher Afzal appeared again, this time joined by people of Chitral. Badly beaten in an initial skirmish, the British found themselves besieged in the fort. Four hundred people with food and ammunition nearly gone were finally bailed out after 46 days by reinforcement from Gilgit who had hauled cannons over the Shandur pass in shoulder high snow. A bigger force fought its way over the Lowari Pass but arrived too late to help. Umra Khan fled to Afghanistan, Sher Afzal was captured, Amir arrested and his 14 years old brother Shuja ul Mulk was commissioned as Mehtar. In the aftermath, this episode somehow got recast as a heroic British campaign and Robertson was even knighted. A classic example of history chronicled from authors' point of view. The British realigned Chitral from a western arm of Gilgit to a more secure northern extension of the NWFP. During the third Afghan War in 1919, Afghan forces invade southern Chitral at Arandu – famous crossing point during Soviet occupation of Afghanistan. Shuja ruled contentedly until 1936, his son Nasir ul Mulk until 1943 and Nasir's brother Muzaffar ul Mulk (who took Chitral into Pakistan at Partition) until 1948. Saif (son of Muzzafar) was killed in 1954 in a plane crash and his four year old son Saif ul Mulk Nasir became Mehtar, the last one, with uncle as regent. 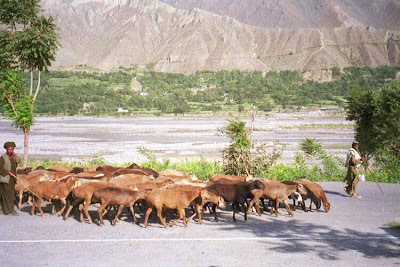 Chitral became an administrative distract in 1969. Chitral is still not accessible in winters when Lowari closes and PIA Foker cannot cross over the mountains. The word is out that government is working on Lowari Tunnel Project and one day the district may join the mainland and not only serve as gateway to Kalash Valley but the area will open to development.